As you may guess from its name, Fei Cui Gong Zhu is a five reel, three row and 20 payline slot with an unmistakably oriental theme. Introducing dragons, pagodas, temples and all manner of other oriental images, Fei Cui Gong Zhu also features wild symbols, scatters, free spins and a bonus round to make gameplay just as attractive as the reels themselves. The top payline jackpot of £250,000 at the highest bet level is one of the more generous payouts you will find anywhere. Additional game features, such as scatter wins and an innovative bonus round, make gameplay pleasantly immersive. The game’s oriental theme and related images are unquestionably easy on the eye. Any one of four progressive jackpots can be won through a jackpot game, which can be randomly triggered after any spin. Players can only stake between 25p and £50 per spin, which may put off some higher rollers who prefer larger bets. Payouts below the top jackpot are actually quite considerably less generous. 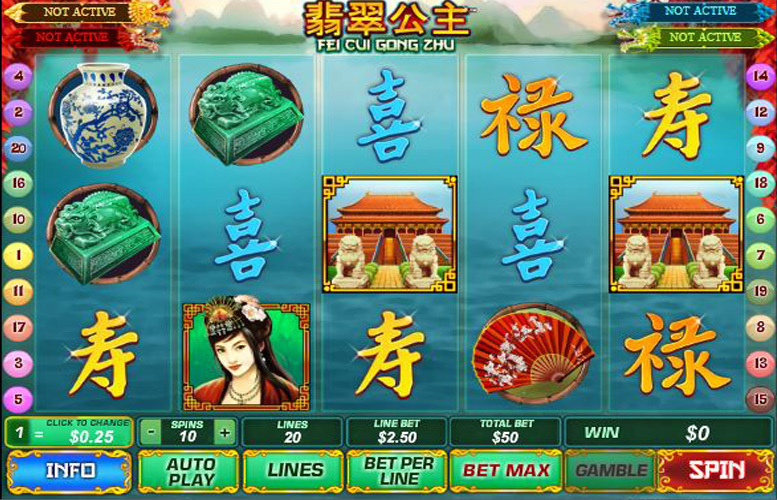 Away from the progressive jackpots, which we will discuss as part of the game features section below, the top Fei Cui Gong Zhu jackpots result when five matching symbols line up along one of the game’s active payline. The largest jackpot of all results when the five matching symbols in question are the game’s Japanese woman wilds symbols. Five of those in combination pay out at a rate of 10,000 times the chosen line bet, meaning that the jackpot can be worth £250,000 at the highest line bet of £2.50. In order to introduce added fun and winning potential to the equation, Fei Cui Gong Zhu boasts a number of additional game features. Those are namely a wild symbol, a scatter symbol, a bonus round and a link to not one but four different progressive jackpots. Showing off an image of a Japanese woman, the slot’s wild symbols can appear anywhere on the reels. As and when they do, they can substitute for all other symbols – barring the scatter and bonus symbols – to make up the nest possible payline combinations. Also able to appear anywhere on the slot’s reels, the Fei Cui Gong Zhu scatter symbols depict a traditional temple and play two different roles. If two or more of the symbols appear, firstly, they trigger instant wins of varying sizes. 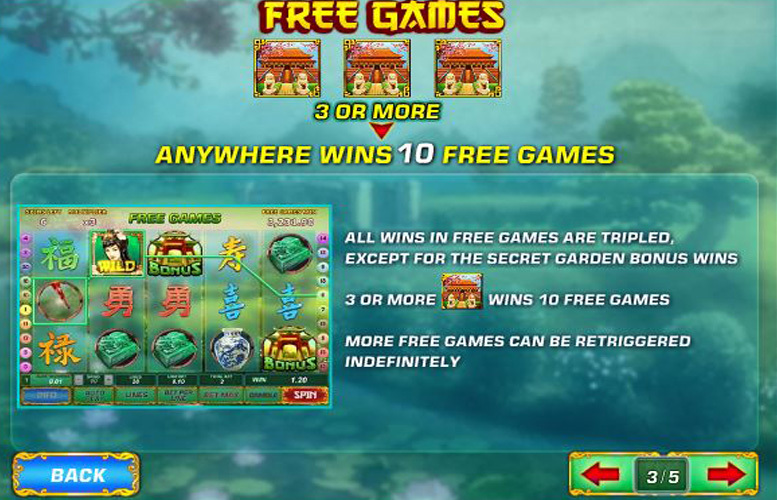 If three or more appear, meanwhile, ten free spins all with a 3x multiplier are also triggered. 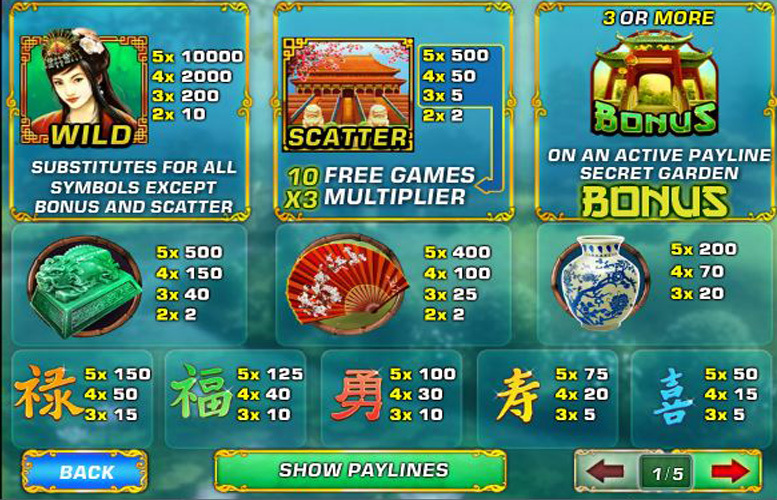 The third and final of this slot’s special symbols are the pagoda bonus symbols, which trigger the secret garden bonus round if three or more line up along an active payline. 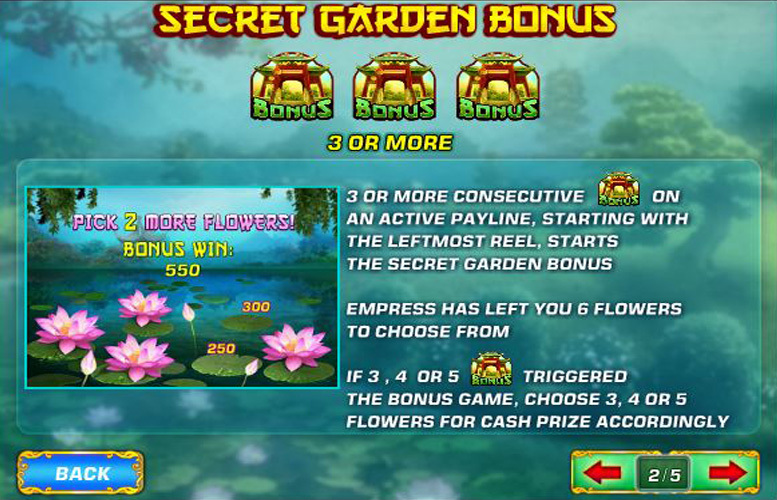 In the bonus round, players can choose either three, four or five lotus flowers (depending on the number of symbols triggering the round), and each flower delivers a cash prize. After any spin in the Fei Cui Gong Zhu slot, a player can randomly trigger a dragon jackpot game. By playing that game, they will then win one of four different dragon progressive jackpots which reach different sizes and will be won at different intervals. The regular symbols on the Fei Cui Gong Zhu reels all either depict characters from the Japanese alphabet or images associated with the orient. The most valuable of the regular symbols are the symbols showing off a jade dragon and an oriental fan. If five of the jade dragon symbols align on an active payline, a resulting jackpot worth 500 times the line bet will be paid out to the lucky player. If a five symbol combination of the fan symbols appears, meanwhile, the payout will be worth 400 times the bet per line. If a Fei Cui Gong Zhu player decides that they’d like to alter the amount they want to wager per spin, they can alter the number of active paylines, the size of their bet per line or both. Overall those options allow for a range of bets falling between a minimum of 25p and a maximum of £50 per spin. Those overall limits are explained, firstly, by the fact that anywhere between one and 20 paylines can be activated for a spin and, secondly, by the fact that line bet options range from 25p to £2.50 per active payline. Anyone with a weakness for Japan or the Orient in general is certain to adore Fei Cui Gong Zhu, which is a beautifully themed and unquestionably attractive slot. What’s more, the game also boasts a number of other advantages to attract a wider range of players. The slot’s linkage to four progressive jackpots is one such advantage, as is the generous £250,000 size of its highest possible payline jackpot. Gameplay, too, is likely to impress many players as it is made really immersive by the inclusion of wilds, scatters and a bonus round. On the flipside, however, there are a couple of notable downsides with the Fei Cui Gong Zhu slot which shouldn’t be overlooked. Those are that its payline payouts below the top jackpot are a little disappointing and that the range of possible line bet amounts is quite limited.